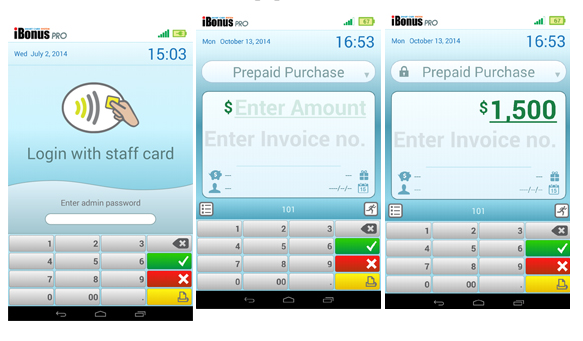 The iBonus Android Application Terminal is the heart and plays a very crucial role in all the loyalty operations. This terminal compactly comprises an entrenched journal database, web server and also has in-built software applications that function individually without any support of additional computer system. All the functions of the terminal can only be accessed by using a keypad. There is an in-built smartcard reader that enables the users to transfer information and data to and from Member Card. All the stored records related to transactions present in the Terminal can be gathered by iBonus Server software through TCP/IP network. The first Member Card is only issued after presenting the first MasterCard supplied by the factory to include the Company Code and other unique Card IDs. With the use of Company Code the particular operator can be identified and the Member Cards will not be accepted on Terminals if Company Code on the Member Card mismatches with the code in the Terminals. The process of converting a Brand New Card to newly formatted Staff Card is called as Issuing Staff Cards. The login ID of Staff Card is asked by the Terminal to allow the staffs to access Member Card operation like deduction or additional of bonus points and much more. When the staff is not attending the Terminal it is requested to log out. The login and logout records are stored automatically after every transaction at the Terminal and it can be used for further auditing purposes. With the use of iBonus Terminal you can enjoy generic type transactions, thus allowing you to do calculations for stored vales including, Bonus Point Addition, Reload, Purchase and Redemption. The functions of all types of transactions are constant due to the combinations of card status, system setting and system status, like, decryption keys, expiry settings, decimal mode, bonus rate, blacklist, card sector usage, card value limits. Any novice users of smartcard system can now make use of iBonus Terminal and develop a loyalty system instantly, without the requirement of redeveloping any complexes algorithm behind. After every successful transaction, like redemptions, adding bonus points and staff login, all the transactions will automatically get stored in the transaction queue of the Terminal. At a time there are over 5000 buffers in the Terminal’s transaction queue. All the records in the queue will be transferred automatically to the server, when it is connected to network. Remember, when the queue is full or jam-packed then it will simply stop accepting further transactions. The iBonus Terminal is designed with advanced technology that comes with sophisticated card handling feature that supports expiry date extension of the card, Lost Card Replacement, Corrupt Card at Terminals of any branch. So, it simply cuts cost that is required to establish contact center for card control and assistance purposes. When there is a printer installed at the Terminal, then after every transaction a receipt is printed. There is also an option to reprint the receipt of last transaction through which you can get the details of last transaction made. Remember to keep the auto reprint option off always or else it will simply print two receipts for each transaction. 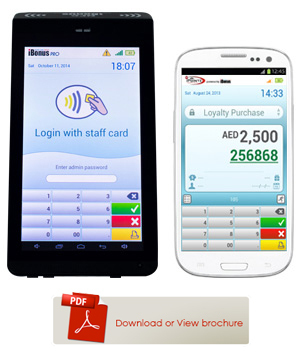 iBonus System focuses on combining the Smartcard system with POS system. 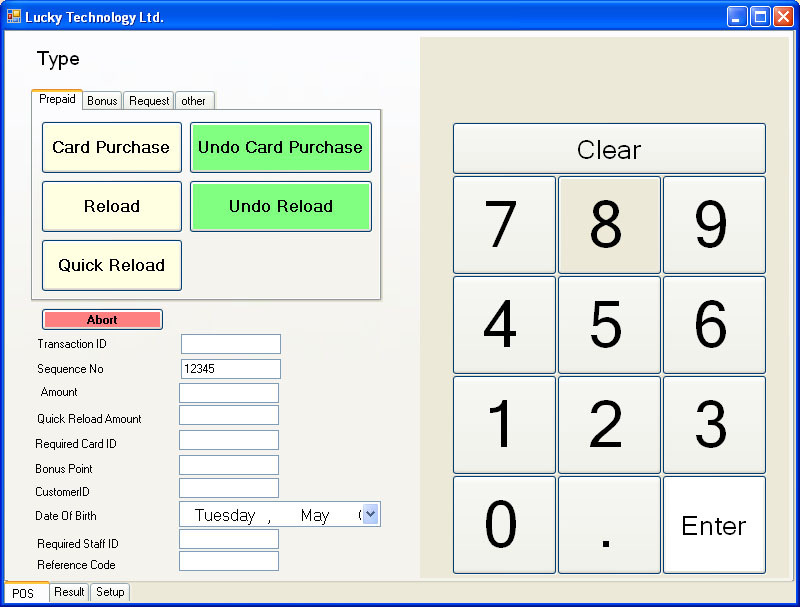 By using RS-232 serial port/ network Port at POS System you can access all transaction types of iBonus Terminal. Since it comprises a ready-to-use Windows based API, it enables you to access all generic transaction set and advanced card handling features with ease. The features like read staff card functions and read member card, allows the POS to command the suitable transaction based on POS side member profile. So, the iBonus Terminal can be connected to POS system at any branch to enjoy the similar features.